More than half of Japan's citizens do not want their next prime minister to visit the controversial Yasukuni war shrine, according to two recent polls. About 54% of respondents to a Mainichi newspaper survey said the next premier should not visit the shrine. A similar poll in the Nihon Keizai Shimbun found 53% of participants opposed such visits. Current Premier Junichiro Koizumi, who is due to step down in September, has been to the shrine five times. The visits anger China and South Korea, which say the shrine honours Japan's militarist past. They object to the fact that 14 Class A war criminals are among the 2.5 million people commemorated at the shrine. According to both surveys, opposition to the shrine visits has risen since the last polls were taken. Mainichi attributed this rise to Japan's ongoing tensions with its regional neighbours, as well as claims that former Emperor Hirohito did not want war criminals included in the shrine. Documents in a recently discovered journal, published last week in the Japanese press, show that Hirohito stopped visiting Yasukuni because of the war criminals honoured there. 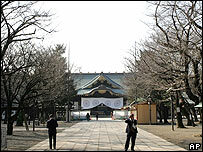 Mr Koizumi is widely expected to make one more visit to the shrine before he steps down as prime minister. Chief Cabinet Secretary Shinzo Abe, the front-running candidate to replace him, has often defended Mr Koizumi's visits. But he has refused to say whether he plans to visit the shrine himself if he becomes the new prime minister. The Nihon Keizai survey, conducted over the weekend, was based on 966 valid responses. The Mainichi survey, carried out over a similar time period, received 1,065 valid answers.